Entity that came to dialogue: Ruanel. Interlocutor: Another of the questions that I have scheduled is related to the chess match between Kasparov and the computer Deep Blue in 1997, more precisely the computer Deep Blue II which was an up-to-date version of the previous one. This match was resigned by Kasparov, obviously because he felt that he couldn’t do anything to win. Interlocutor: Okay, he lost. I was saying that in this game Kasparov resigned, being disappointed because he suspected that the machine was being helped by “human hands” that is to say, violating the rules. I saw the documentary titled "Game Over: Kasparov and The Machine", in which Kasparov made that insinuation based when he saw that the computer had made impossible moves for a machine. Ruanel: I confirm completely that there was a human hand or rather human hands that programmed the machine. Interlocutor: I am not understanding your answer very well. Ruanel: I am being ironic. Interlocutor: Concretely then, Are you saying that there was no trick or cheat? Ruanel: Correct, there was no trick of any nature. Ruanel: I confirm it completely. The machine was well programmed and it defeated Kasparov. Interlocutor: Then, concretely, there was no human help to the computer during the games. Ruanel: That’s right. The human hands behind the computer were when it was programmed, but during the games there was no help. Interlocutor: Didn't the technicians violate any rule then? 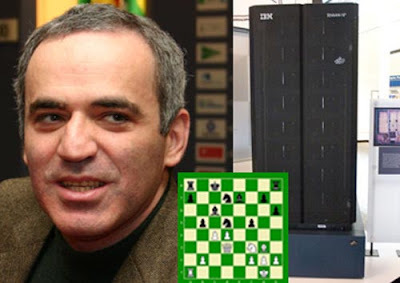 Interlocutor: Therefore, Kasparov lost according to the rules, but the question is: Why didn't the technicians of IBM who programmed the machine allow the investigation on the games that Kasparov requested? Ruanel: Because of pride, vanity or dignity, because they felt offended, impaired in their good faith, and directly they refused. Interlocutor: I understand. I have the purpose of making a Web page to vindicate the technicians of the IBM of the suspicions of Kasparov. Ruanel: In the future there will be new technicians that program a machine in such a way that even gathering the 10 best players of the World and among all of them they will not be able to defeat the machine. But the chess players don't have to be impaired of being defeated by a machine because after all, the machine has been programmed by chess players. they Have to understand that it is not a machine the one that is defeating the man: It’s the man the one who is defeating the man. Ruanel: They are so tiny in their understanding, beings that perhaps know twenty moves in advance from the opponent. Without damage of random, which is always present, since there are infinity of variantions, but they don't keep in mind as I said, after all is the man that is defeating the man not the machine. Interlocutor: It is clear, but I think that Kasparov legally could suspect that there was something strange in some games, which were apparently impossible for a machine. Ruanel: It was his ego the one that made him suspect. Ruanel: Correct, Only his ego. Interlocutor: A last question: Could it be published that in the future there will be a machine to which the most expert chess players of the world will be able to draw only that is to say that it would be so perfect that even with the combined effort of the 10 best chess players of the World they Could Only draw? Ruanel: I already said it before, in the future there will be machines that cannot be defeated. they will be able to draw obviously. It’s easy to draw a game. Even a Grandmaster of chess, one who is below the number 100, very prepared, with a good psychologist -and here I speak about a psychologist because it is so much the pressure that the chess playere has to deal with- that he needs a moral backup. He Could draw with the machine not Win, but he would be able to draw. This entry was posted at Wednesday, August 26, 2009 and is filed under History . You can follow any responses to this entry through the .